Here’s the last of our 2018 MLB Draft recap. While most (all?) of these players won’t make it to the majors (and maybe won’t sign), some of the selections have fun profiles. Here are the picks in list form. There wasn’t a ton of information about the Dodgers’ 31st-rounder, but Shaps was a 2-way player at William Jessup, which is reason enough for the Dodgers to be interesting in him. He played three seasons at Arizona State before transferring to William Jessup for his senior season. With ASU, he hit .307/.357/.455 in 365 career plate appearances. He threw just 4 2/3 innings for the Sun Devils in which he allowed one hit, three runs, walked three and struck out 11. With WJU, he hit .453/.500/.676 in 36 plate appearances. On the bump, he struck out 19 in 14 1/3 innings. He also allowed 15 hits and 9 runs while walking 7. Now, I say he “transferred” to WJU, but his time with ASU didn’t end well. He was dismissed from the team on May 6, 2017, after an online argument with Tracy Smith’s son. Smith is the ASU head baseball coach. Fun stuff! He missed the first five games of his final season with ASU because he was suspended, so there might be some character/off-the-field issues here, but there were no such incidents at WJU. Anyway, he’s an interesting 2-way prospect for the Dodgers to grab this late in the draft. He should be an incredibly easy sign. Gilliland was one of the few high school players the Dodgers selected in the draft, and he has a bit of potential. He has a 3-pitch mix — a fastball, curveball and changeup. Like with most prep pitchers, his curveball is ahead of his changeup and his fastball is ahead of his curveball. His fastball checks in at 89-92 MPH and has touched the 93. He doesn’t have the most projectable frame, but he could add some velocity down the road. His curveball is a mid-70s pitch while his changeup is a work in process. Here’s what Perfect Game wrote about him back in March after one of its events. Gilliland is going to be a tough sign, mostly because the Dodgers probably aren’t going to have a lot of extra money to sign draftees. The last high schooler drafted this late by the Dodgers was Logan Crouse, who signed for $500,000 (and he has since been released). If they could get him or another of the prep guys they popped after the 10th round, that could help this draft look a bit better. Avans is a college performer who ripped through the Southland Conference. He hit ..330/.462/.568 and walked more than he struck out. There’s not a whole lot of other information readily available, so here’s him hitting a home run. He also has experience on the mound, so the Dodgers could try him as a 2-way player. He should be an easy sign as a college senior. There’s not a lo available on the Dodgers’ 34th-rounder. He started 13 games for North Florida this season and posted a 4.85 ERA in 68 2/3 innings. He had just a 7.6 K/9, so this pick is a bit different than most Dodger draftees and those in the organization already. But hey, he’s left-handed and breathing, so he’ll have a job somewhere. He’s a senior pick and should be signed, if he isn’t officially already. 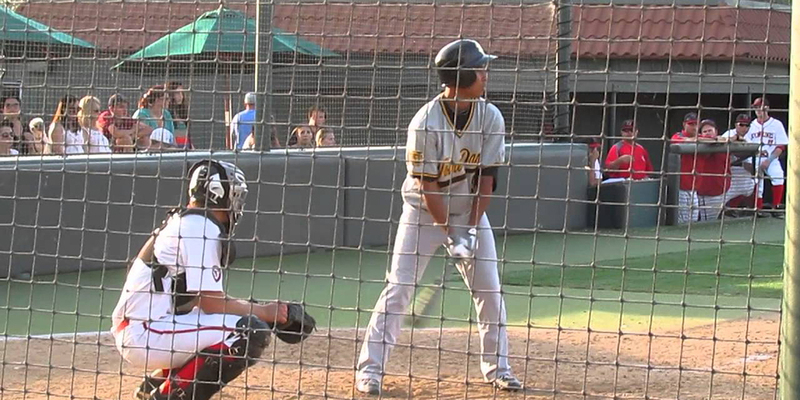 The Dodgers added another premium athlete to the draft class in Reichenborn. He dominated the Scenic West Athletic Conference (yes, this is a real conference). He hit .418/.522/.670 with 28 of his 76 hits going for extra bases. He also walked 14 more times than he struck out. He has a simply, compact stance, quick load and surprisingly decent bat speed — at least, better than I was expecting. If he signs, he could get to Ogden before the season ends. Vison might be my favorite player of this entire draft class, and I’ll give you one guess why. Even Billy Gasparino said his listed height “might be stretching it.” Pun intended, I’m sure. For Golden West College, Vison hit .361/.432/.444 and swiped 26 bases. Despite that, he’s not the fastest or most athletic player the Dodgers drafted, but he might be the most unique. It appears he has signed, which isn’t surprising in the slightest. On the surface, Littel looks like he has a good frame and the athleticism to succeed in baseball, but he was just OK at Oklahoma State (but he is coming off his best season as a Cowboy). He hit .266/.372/.454 in 218 plate appearances in 2018. He has the ability to draw a walk while minimizing his strikeouts. He was the Nationals’ 39th-round pick in 2014. The video is four years old, but it was about the best I could find. As a senior, he’ll be an easy sign. Peters is a large human being already at 18 years old. I’d be a lot more excited about the possibility of the Dodgers adding a high school arm with four pitches (fastball, curveball, slider, changeup) this late in the draft. They popped Caleb Ferguson in the 38th round four years ago, so the hope was there. Apologies for the video shot in portrait mode. But this is the pitcher the Dodgers could have had because Peters told the Cleburne Times-Review he’s going to Wichita State. Myrow was the second player of this draft the Dodgers selected from San Jacinto College North (Trey Dillard, 16th round). He originally was slated to go to UCLA, but plans changed after an injury and he ended up in Texas. Here’s his MLB.com draft video from three years ago as he was coming out of Notre Dame High School (Giancarlo Stanton‘s alma mater). He was clocked at 99 MPH, according to his San Jacinto College North profile. I’m assuming that’s from the mound, because if that’s from the outfield, that’s the best arm in the game right now. He’s also Dave Roberts‘ godson. The last time the Dodgers chose the godson of someone in the organization later in the draft, he turned into a Hall of Fame catcher. So yes, Myrow is the next Mike Piazza. But that’s not even the most interesting part. Myrow was once homeless. The kid is a fighter. Here’s hoping the Dodgers can sign him and he can get to playing pro ball. Mr. Irrelevant — a moniker I never much cared for when referring to the final pick of the draft — is the Dodgers taking a shot on another prep arm in Mr. Specht. He has a fastball that has gotten up to 93 MPH but settles in at 88-91 MPH right now. He backs it up with what appears to be a high-spin curveball, and we know the Dodgers like spin rates. The ball comes out of his hand weird. I can’t tell if it adds to his deception or is a problem. Perfect Game had a glowing write-up of him after a June 2017 showcase event. They gave him a 9.5 grade, which meant he could have been a Top 10 round (or higher) pick. That was almost a year ago, so something must have changed. If the Dodgers can get him to sign, that’d be a massive steal. However, I’d expect him to honor his commitment to the University of Florida. That concludes the draft recap. Stay tuned for draft signing updates (18th-rounder Niko Hulsizer has signed).